4.1 Let’s take a look at the advantages each one has over the other. Are you tired of cramming your family into your car along with your luggage on longer trips? 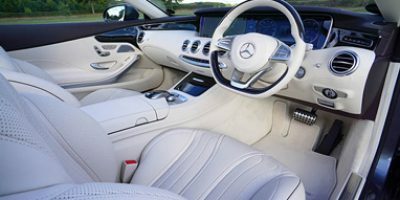 Maybe you haul pesticides or cleaning chemicals that you don’t want to expose your vehicles interior two? This is a dilemma that many people face that is not as difficult as you think to overcome. That’s because you can purchase a vehicle cargo carrier that will help you store your luggage or more volatile goods safely outside your car. 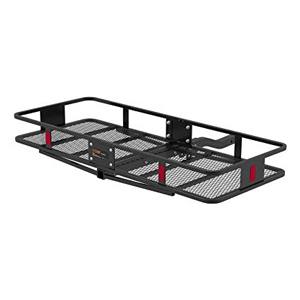 The best hitch cargo carrier will offer you that additional outside storage that you need. That’s what this article is all about. It will give you all the information you need to make a sound hitch cargo carrier purchase. You will learn more about these handy devices through our buying guide and hitch cargo carrier reviews. They will tell you everything you need to know about what makes a hitch cargo carrier a quality one. These are some of the absolute best hitch cargo carriers you will find out there in the auto marketplace. Curt is a much-respected name when it comes to hitch cargo carriers. They have many excellent models to choose from like this versatile 60” basket-style cargo carrier. Its size and its almost 6” high sides allow for you to carry a lot of items in it. You can carry up to 500-pounds of cargo at any one time. It has several nice features designed into it. These include its curved rising shank which raises it up a little for easier loading and unloading. The shank will also fold so you do not have to remove the cargo carrier when it’s not in use. It’s a very durable cargo carrier to thanks to its tubular steel construction with corrosion resistant powder coating. This is a very functional and durable hitch cargo carrier design. It’s a basket-style cargo carrier that also has 6” high walls all the way around it. That combined with it’s generous 60” x 24” size allows you to carry many items in it safely and securely. It will easily handle hauling up to 500-pounds of cargo. It’s durable because its frame is made of very tough tubular steel. That steel is also nicely powder coated to help it resist corrosion. It also has a sturdy Z-style shank that allows it to fold up when the carrier is not in use. This is a little different design when it comes to hitch cargo carriers. It is kind of a basket style and tray style hybrid design. That’s because its 4” high walls only go half way around it. Because of that, you can slightly overhang some items toward the vehicle side (must be fastened very securely). Also, since its only 48” long, it’s great for smaller cars, trucks and SUV’s that have hitches. This is a straight shank cargo carrier that does not fold up for when it’s not in use. It’s made out of tough tubular steel construction that allows it to hold up to 500-pounds of cargo. This product comes with a 1-year warranty from CargoLoc too. This is an impressive item because it’s a kit that has absolutely everything you want to go along with your new hitch cargo carrier. You not only get a generous size 60” x 20” platform to place cargo on, but you also get ratchet straps, cargo bag, cargo net and even a hitch stabilizing device. 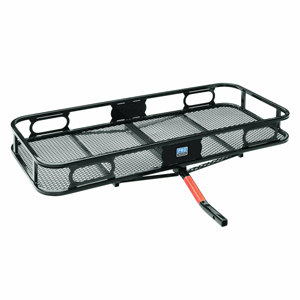 The cargo carrier itself is made of heavy duty steel that is lightly powder coated. It features a curved shaft design which helps raise it up a little for easier loading and unloading. The 60” x 20” platform size is suitable for many medium to large size vehicles. There is also a 6” high wall that goes all the way around the platform. Here is another very well designed basket style hitch cargo carrier. This one is perfect for smaller vehicles that don’t want to haul a lot of weight. It’s only rated for 300-pound load capacity and it also uses a smaller 1 ¼” x 1 ¼” receiver. Don’t mistake that for not being beefy enough to get the job done. It’s a sturdily built 48” x 20” cargo carrying platform. It also has built-in side rails which help with packing and tying down the cargo you are carrying. The rising shank design has also raised this unit up slightly for easier packing and unpacking. This is a surprisingly sturdy basket style hitch cargo carrier. That’s most likely due to its heavy duty tubular steel construction and its corrosion resistant powder coating. It is rated for carrying up to 500-pounds of cargo. That cargo will load and secure easily thanks to the 4-inch high side rail that runs around the entire outside of it. The platform on this cargo carrier measures a generous 53” x 19”. That means you will have lots of room left inside your vehicle when traveling. Its straight shank design secures firmly inside any 2” size receiver hitch. This even comes with a spare hitch pin for you to have just in case. Here are some of the main features and characteristics of hitch cargo carriers to focus on when shopping for them. We chose bullet points for emphasis just like with our steering wheel lock buying guide. The size of your cargo carrier is important for several reasons. One, it has to be able to hold all of the stuff that you want to carry in it. It also must be able to fit on the type of vehicle you have too. The length of cargo carriers usually ranges anywhere from 24” or less. Widths typically range from 48” to 60”. A good way to get a rough estimate of the minimum size cargo carrier you need is to stack your stuff that you want to put into your cargo carrier in a rectangle and then measure the size of that rectangle. Keep in mind that putting longer hitch cargo carriers so they stick out past the sides of smaller vehicles is never recommended. If you need more room than a 48” cargo carrier gives you then add a car top carrier for your trip too. All cargo carrier manufacturers list the load capacity that they feel their hitch cargo carriers can withstand. It’s very important never to exceed this weight. So you have to get one that is rated higher than the weight of what you plan to carry. Remember also that small items can weigh a lot more than they look. This is especially true if they contain liquids in them. You can use a household bathroom scale to roughly measure the weight of the items going into your cargo carrier. Hitch cargo carrier baskets give you a lot of carrying options with your vehicle. That’s the reason they are the most popular hitch cargo carrier choice. They have sturdy bottoms and sides that rise up anywhere from 6” to 19”. This means you can put a large variety of cargo on them. This type of cargo carrier has one advantage over other types of cargo carriers. That’s because they have no sides or sides that are removable. Why is that an advantage? It’s because you can load them so the cargo goes slightly past the edges (as long as it’s strapped down very well). So you can put a little bit bigger items on them. 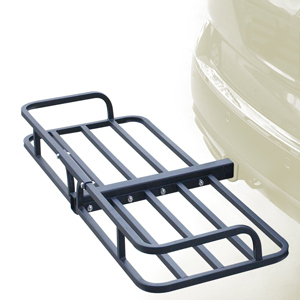 These hitch cargo carriers are very similar to car top carriers. They are fully encapsulated so they do a great job at keeping the cargo in them dry and away from the elements. The drawback with them is they are costly and their angular design limits the size of the cargo you can place in them. Which style cargo carrier you choose depends upon what you are hauling and personal preference plays a role in your decision too. Most hitch cargo carriers in the market require a receiver size that is 2” x 2”. Be aware though that there are both smaller size receiver hitches (1 ¼” x 1 ¼”) and hitch cargo carriers that are made to fit them. So make sure you know the receiver size you need for the model of cargo carrier you are thinking about purchasing. These types of cargo carrier shafts just stick straight out from the receiver they are placed into. They do not increase the height of your cargo carrier like rising shaft cargo carriers do. Straight shaft cargo carriers are sturdier than curved counterparts so you can generally haul loads with less bouncing. It’s no secret that hitches are located on the frame of your car or truck. That means they are mounted very low on your vehicle. So when you put on a hitch carrier it will also be down a little low. That’s why many manufacturers use a rising type hitch shaft that lifts the cargo carrier higher for easier access. This gives you increased height with your hitch cargo carrier just like a curved shaft does but it’s a little sturdier. That’s because instead of curving to rise up, it’s more like two straight shafts with the ends bolted one above the other to a plate. So you do not get some of the bounce you get when driving with curved shaft cargo carriers. 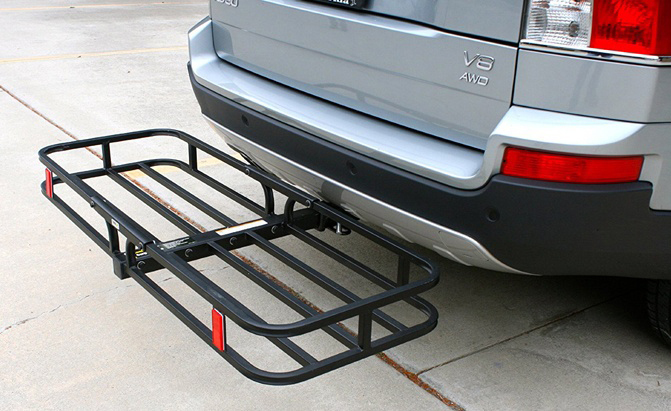 However, this also increases the weight of the hitch cargo carrier. It also allows this type of cargo carrier to fold up when not in use. It’s a big bonus if your hitch cargo carrier can fold up when it’s not in use. Many models do this and you can’t always tell just by looking at them. So make sure you read the specs on any model car carrier to see if it folds or not. If it does, then you do not have to drive around with a fully deployed car carrier with nothing in it when you are away from home. Although these are not prices very high for what you get, they are still not what you would call a disposable item by any means. You really want them to come with a good warranty in that case. Look for a warranty that covers everything from workmanship to corrosion of the coating if you can find one. One of the nice things about hitch style cargo carriers is they have been around a long time now. That means you can find a bunch of different accessories for them that make them even more useful. Here are some of the most popular accessories for them. 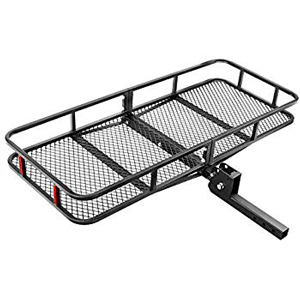 Some model hitch cargo carriers will even come with one or more of these accessories. So consider it a nice added bonus if they do. They free up a large amount of space inside your vehicle. This will make traveling on longer trips a lot more comfortable than ever before. You can bring more stuff with you. Most of us have gone to visit someone or to get garden supplies and wish we had more room for stuff. A hitch style cargo carrier will give you that extra room you need for purchases or bringing more items to your destination. Have you ever gotten frustrated trying to pack items in the little space inside your car or SUV? Problem solved with a cargo carrier. They are much simpler to pack than packing things inside a vehicle. You don’t have to haul unsafe items such as pesticides, fertilizers, gasoline cans and paints inside of your car anymore. You no longer have to take health risks hauling these types of items. If you are a contractor or handyman you can use them for that extra storage space you need for work items. Rooftop car carriers have long been the preferred method for creating extra storage space with cars and SUV’s. That has changed over the last decade or so as hitch cargo carriers have come into the market place. Now hitch style cargo carriers are starting to become purchased in about the same numbers as rooftop cargo carriers. Let’s take a look at the advantages each one has over the other. These cargo carriers protect well the items you are transporting from the elements without additional accessories. They add less air drag when installed on the back of a vehicle than rooftop cargo carriers. This will save you money on gas on longer trips. Hitch style cargo carriers generally hold a lot more weight. Rooftop cargo carriers normally cannot hold over 200-pounds of cargo. Hitch cargo carriers can hold as much as 500-pounds of cargo or more in most cases. These cargo carriers are much easier to install. To install a rooftop cargo carrier you will need to get up in the air in awkward positions and have some help. Hitch cargo carriers can be installed by two people working at ground level in a matter of minutes. Hitch cargo carriers are more versatile. You can transport goods in them packed with a cargo net over them, packed away from the elements in a cargo bag or use them open to haul heavier materials such as buckets of chlorine for your swimming pool. Rooftop cargo carriers can only be packed one way. Generally, you do not see many rooftop cargo carriers that fit on top of pickup trucks. 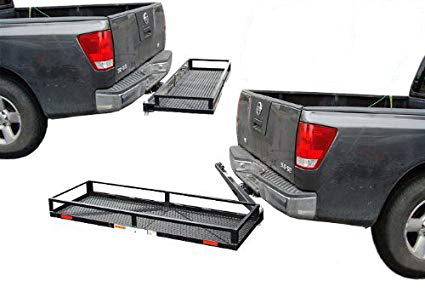 Anyone with a pickup truck and receiver-style hitch can use a hitch cargo carrier. They are much easier to pack than rooftop cargo carriers. Rooftop car carriers you have to lift items up to head level to pack. With hitch style cargo carriers you are packing an open space at waist high level. From this list, it’s not hard to see why hitch cargo carriers are capturing a bigger share of the vehicle cargo carrier market than ever before. Step 1: Make sure the trailer ball insert is not in the receiver end of the hitch. Step 2: Grab a friend and ask them for a quick hand. Step 3: Carefully line up the hitch cargo carrier shaft with the receiver portion of the hitch. Then insert the cargo carrier shaft slowly into the hitch receiver. Step 4: Secure the cargo carrier in the receiver by inserting the hitch pin into the proper side hole. Make sure you place the safety pin into the side of the hitch pin after you do this to keep the hitch pin from vibrating out as you drive. This whole process should take you less than 5-minutes if you have some help. These have been proven to be very safe over the year. Most of the incidents involving these cargo carrying devices are due to operator error and not to the design of the cargo carriers themselves. 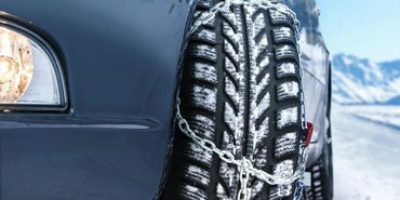 Most accidents involving them include improper installation, overloading or forgetting they are on your vehicle when backing up. So, in general, they are thought to be a very safe item as far as the design and use of them is concerned. Question: Are the sides of hitch cargo carriers strong enough to fasten bungee cords and ratchet straps too? Answer: In all but a few rare cases the answer would be yes. 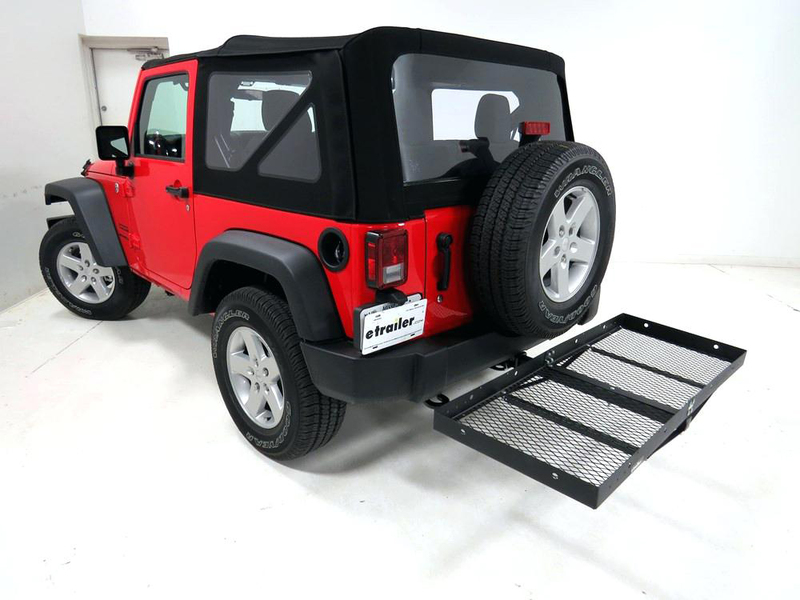 The rails have been designed not only to hold the cargo in place at the bottom but also so you can use straps, ropes or bungee cords to secure your load in place even better. Question: My friends and I are into mountain biking and camping. So I bike rack will not help when it comes time to haul extra camping gear. Can you use a hitch cargo carrier to haul a few mountain bikes? Answer: As long as you can get them to fit and get them securely fastened I don’t see any reason why you can’t haul them with a cargo carrier. Many people are already using them for multiple purposes just like you intend to do. Question: Do you recommend any one style hitch cargo carrier over another? 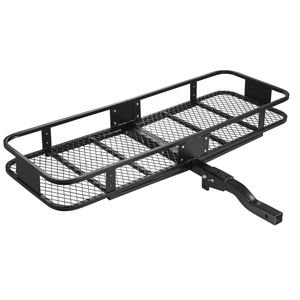 Answer: Most people will choose a basket style hitch cargo carrier over the other types because they are so versatile. Don’t mistake that for meaning that the other styles of hitch cargo carriers don’t have their uses. It all comes down to personal preference and what you plan to use your cargo carrier for. 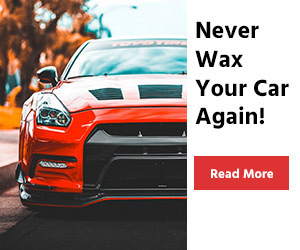 When you’re done, don’t forget to read our car bumper guard reviews round-up. If you want to get the most out of your vehicle, check our homepage for the favorite car accessories buying guides. Lacking space in their vehicle is something that many people deal with. This applies whether going on long distance trips or just driving around town. Having a hitch cargo carrier is an easy and affordable way to resolve your car space problems. The only problem is there is a large variety to choose from and all of them are not good ones. So follow the advice closely that we give you here when you are looking to buy a hitch cargo carrier. The information in the buying guide will steer you towards the most important characteristics to look at when shopping for a new cargo carrier. 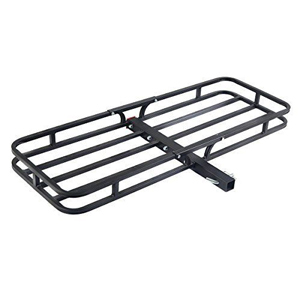 You also can never go wrong by selecting one of the items we did hitch cargo carrier reviews on. Do these things and you will have no problem finding the best hitch cargo carrier for your needs.